The competences gained in more than 60 years of activity in the production of plastic stock shapes and technical industrial components made of engineering plastica; an organization structured at an international level in units specialized in the different processes of plastic injection moulding, composite fibers and hard coating on polycarbonate; a presence spread on the international market through a group of productive societies in Italy, England, Holland, Indonesia and South Africa, controlled by Bell Safety holding; these are the strengths which make Omnia Plastica and all the companies in the group a reference in the field of injection moulding and stock shapes produced by extrusion, casting and RIM. 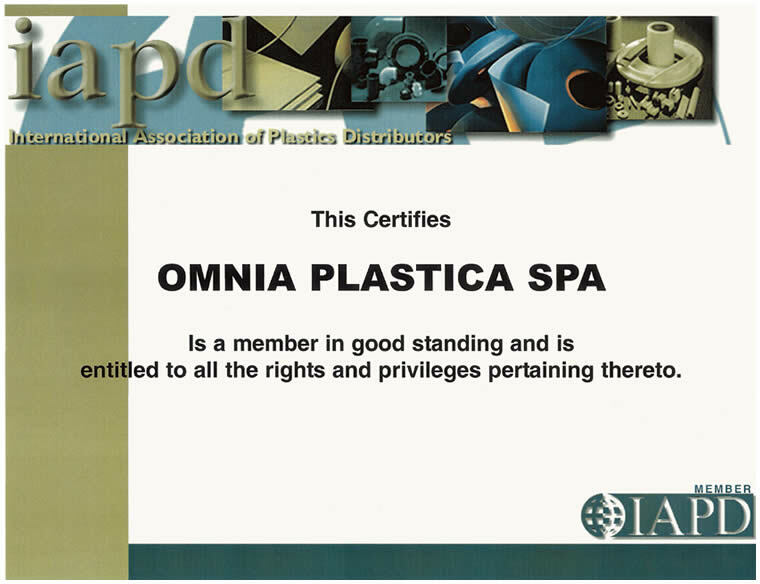 The deep knowledge of the way of transforming plastics, together with the constant investments in plants and equipments, are the main topics that have been leading Omnia Plastica since 1950. 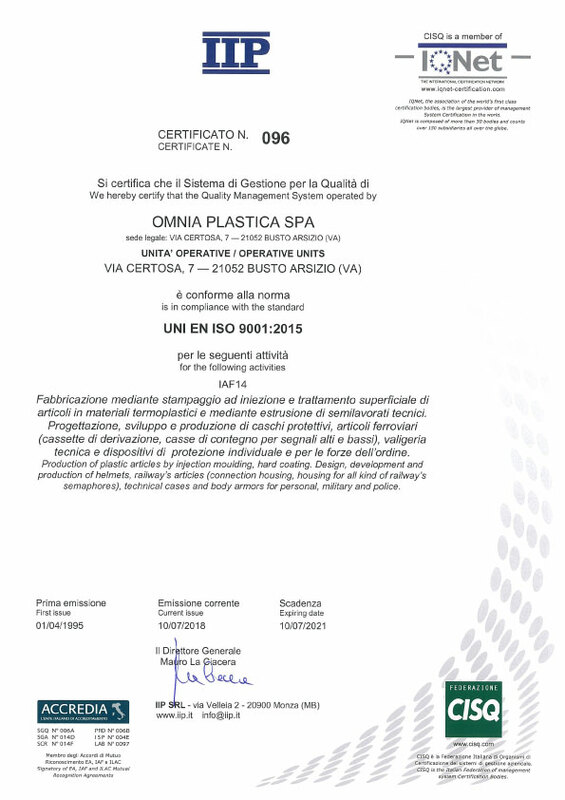 Omnia Plastica produces under a quality and safety integrated system, certified according to the regulation UNI EN ISO9001:2008 issued by the Istituto Italiano dei Plastici (IIP). The certification involves all the production divisions: from the raw material incoming, through the processing, up to the semi-finished or finished parts in order to supply products in quality. The assurance of a constant quality comes out from automated production processes and monitoring procedures carried out by trained and constantly up-to-date staff. 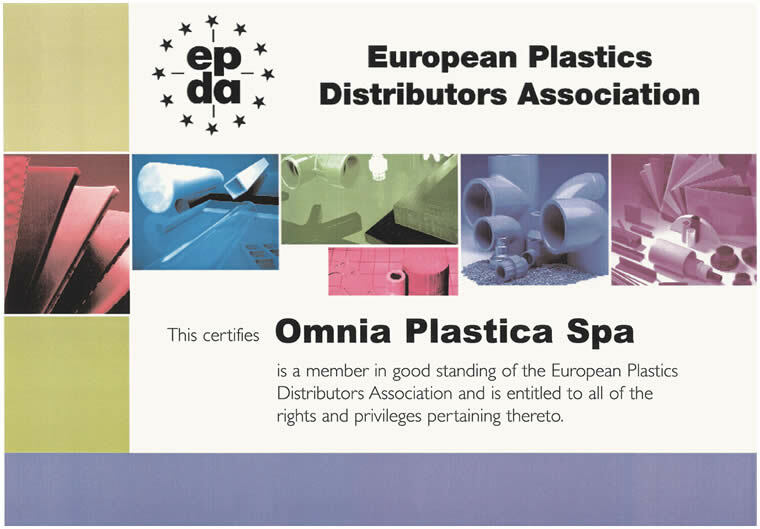 Omnia Plastica is a member of IAPD (International Association of Plastics Distributors) and EPDA (European Plastics Distributors Association). Pierino Castiglioni founded Omnia Plastica SAS. The company core business focused on technical items injection moulding. Pierino Castiglioni company has been officially established. The moulding division expands with new presses. New technical staff is hired to support new customers’ needs. 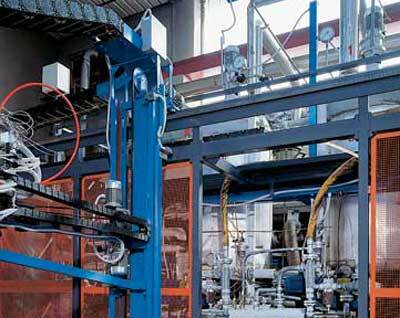 Inauguration of the extrusion process of technical semi-finished plastics. Furnaces to removed internal product strain. Omnia Plastica diversified its business by producing the first motorcycle polycarbonate helmet. This event marked the starting point of a production devoted to high technological finished molded products with abrasion-resistant and anti-fog treatment. First firefighter helmet made out of polycarbonate for the United States. Industrial Plastics Europe BV was born in Nieuwegein, The Netherlands. The over 4,500 square meter production unit is devoted to the production of high technological and wear-resistant semi-finished plastics and plastic components. Omnia Plastica invests in the anionic polymerization of caprolactam, that is to say, cast PA6 casting. The company Plastici Industriali srl was born. The 2,500 square meter facility located in Cinisello Balsamo deals with the production and distribution of semi-finished plastics, highly technological finished and semi-finished components made of polymeric materials. Omnia Plastica invested in the hard coating of polycarbonate pieces moulded with optic quality. 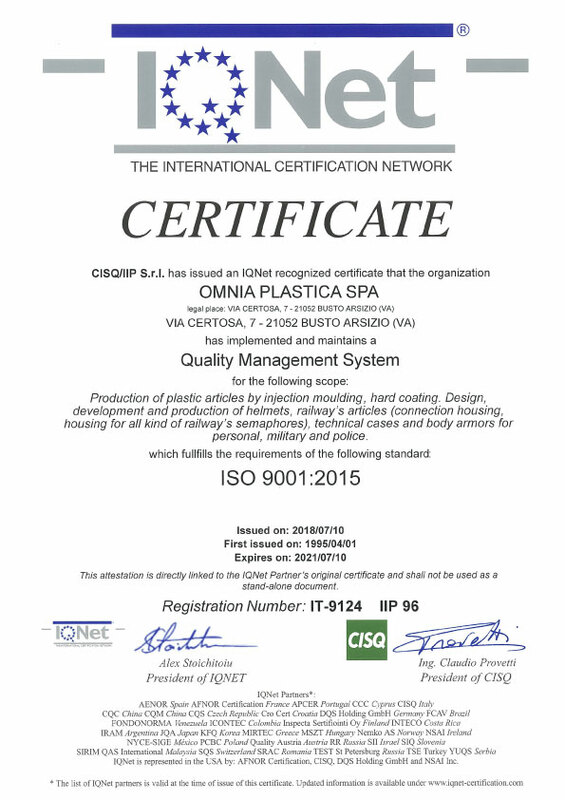 The internationalization process moves on with the creation of Plastim Ltd. In the actual plant of 2.000 square meters, thermoplastic materials are produced for UK and Ireland market. Omnia Plastica takes part in the group Bieffe Holding Srl and acquires the division devoted to products for public order: anti-riot shields, tactical body armors, protective helmets, batons, masks. Omnia Plastica acquires Bell’s trademark for motorcycle helmets and public order helmets and founded Bell Motohelmets srl; then, Motosport srl is founded, based in Lucca to produce, assemble and distribute dot and jet motorcycle helmets both for sports, free time and public order. Development to East Asia where, through the co-participation of one of the biggest companies producing sports helmets, the society PT Vista Kusuma was created for the production of helmet visors and optic screens with abrasion-resistant treatments. The company Compositi Industriali srl devoted to the production of composite fibers is incorporated into the society Motosport srl. PLASTEM (Pyt) LTD is born in Johannesburg, Africa. This company deals with the resale and mechanical processing of plastic sheets.